If you play rugby and would like the opportunity to play Tag at the highest level by representing your Region, and then if selected Ireland, you should seriously consider playing in the Men's Only Tag League. Whether you get a gang of your rugby team mates to enter, or join the team of individuals we are putting together, the Men's Only Tag League will be very fast and of a very high standard each week. Everyone playing in this league is eligible to play Representative Tag at a regional and national level. Matches are played under International Tag Federation laws, which have a number of differences to standard Mixed Social Tag laws. All games at Representative & International level use ITF laws so players chosen for these teams will be very familiar with them after playing in the Men's Only League. Games are 8 a side, where you can have up to 8 subs on the sideline so a maximum of 16 players in your squad each night. Matches are 40 minutes long with 2 x 20 min halves and 5 mins for half time. Please note that the fixtures for Men's Tag & Premiership/Mixed Social in UCD and Old Crescent on Tuesdays will not overlap, allowing you play in both leagues on the same night. Check out the Basic Laws for Men's Only Tag below. · To start a game, you must have at least 5 players on pitch. · Ball must be placed on ground first before elbows or knees. · No surrendering. An attacker must keep moving - they cannot deliberately stop and present tags to defender. 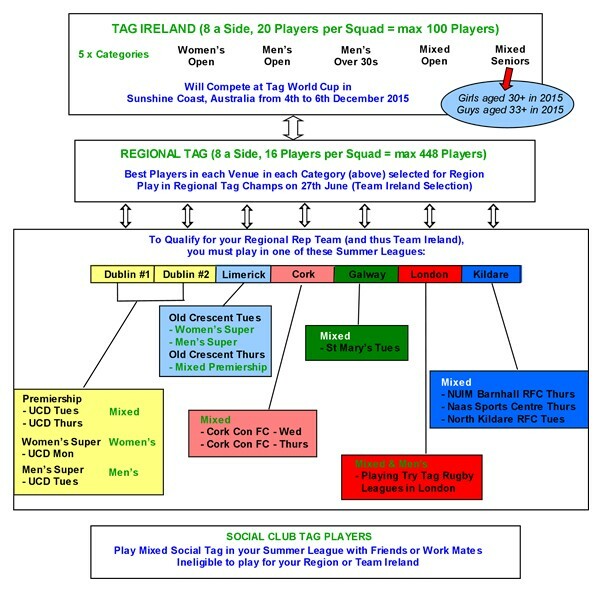 As we are now a member of the International Tag Federation, we have developed a pathway for male players to play Men's Tag firstly for your Region and then, if selected, for Ireland. To be eligible for selection, you must be playing in your local Men's Only Tag League.